BEST Vacation Rental in Scottsdale is BACK!!! Premier Old Town Scottsdale LOCATION! Fully furnished executive rental is available for your visit to Scottsdale-Paradise Valley. Ideal for vacations, seasonal stays, temporary assignments, job relocations, insurance relocations, girlsl weekend, guys weekend. 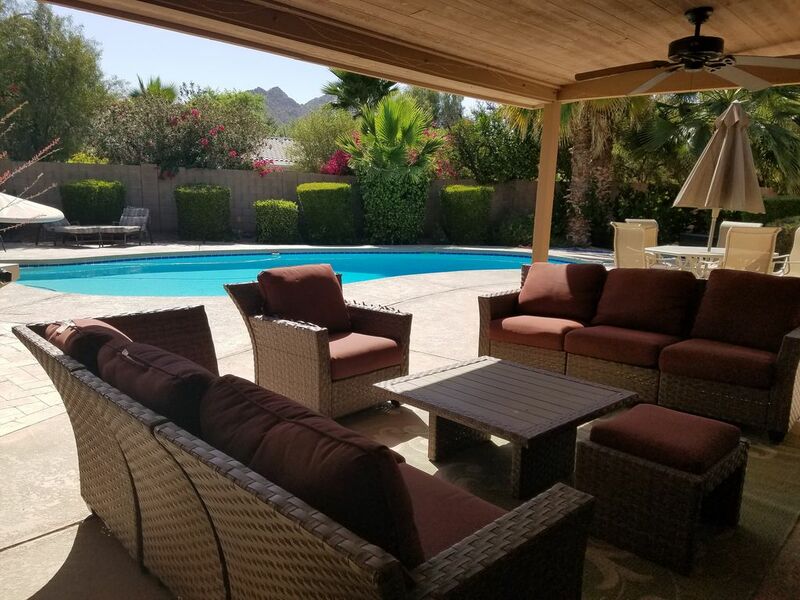 This house is located at the north end of Old Town Scottsdale, and the south end of exclusive Paradise Valley (this address is Scottsdale, in the town/zip for PV). The house is just minutes from the 101 loop (Chaparral exit), and about 15 from PHX Sky Harbor airport. This 4BR + 3.5 bathroom single-story home sleeps 12 comfortably in queen and king beds, and queen sofabed, 3 large couches in LR, FR, master that will sleep more, The house features TWO master suites, travertine tile throughout, neutral carpet in all bedrooms. Spacious living areas include living room, dining room, family room, two fireplaces. All newer appliances, and washer/dryer/laundry area. The (primary) Master bedroom is spacious with a sitting area, a TV in the FR, LR, and each of the 4 bedrooms, fully stocked kitchen, outdoor kitchen, patio area, barbecue over looking the pool, and a little putt n pitch too! Situated on a very quiet cul de sac, with a large circular driveway for parking 6+ cars, plus extra large 2+ car garage with plenty of storage. Plenty of room for your boat or RV. Outdoor patio with kitchen overlooks the sparkling pool. Enjoy a cocktail or soda on the patio while watching the sunset behind the Camelback Mountains! Prices include all landscape, pool services, and all utilities. Move-in ready! Just bring your suitcase! We welcome guest stays short or long! Discounts available at 7+ days, and 30+ days. Inquire about stays 60+ days for a special discount. We purchased the home in 2005, remodeled, and lived in it from 2015-2018. Prior to that it was the most popular Old Town Scottsdale Corporate Rental on VRBO! We are all California natives who now call Scottsdale, Arizona our home(s)! It is in the premiere Arizona destination location, on the north end of Old Town Scottsdale, on a very private cul de sac, yet steps to the intersection of E Chaparral and N 68th St at the entrance to the very exclusive town of Paradise Valley. You can walk to dining, shopping, arts, galleries, waterfront. It is minutes from the Scottsdale Stadium, Talking Stick, and many other baseball spring training venues! It is also just a $15-$25 uber/lyft ride from the Phoenix Sky Harbor Airport! Bicycles and scooters for rent by the hour! This is the largest furnished rentals in the heart of Old Town Scottsdale or close-in Paradise Valley, as we have been told! Close to Fashion Square Mall, and all the sites and conveniences of Old Town - Downtown Scottsdale. We have working with many large corporations on temporary assignments for their employees! Please inquire for more information, and discounted rates for advance payment for longer stays. Feels like a resort in the back yard! Away from the immediate hubbub of town, but walking distance to the Old Town Scottsdale fun, shopping, eating! We have no lan line, because no matter what number it is, all we get is wrong numbers and solicitations! Fresh linens, bath, and pool towels, and lots of extras for sofa sleeping. Oversize 2 car garage, large circular driveway, with plenty of room for your RV and/or boat, or multiple cars. Formal living room, with large sofa, lounge & ottoman (sleeps 2), and queen sofabed. Living room sleeps 4, if desired. ifchairs. TV in family room, and each of the bedrooms. Sparkling pool (not heated), with weekly pool service. Great house for corporate, family, friend, golf trip, weddings, and Arizona Staycations too! We've housed neighbors during their remodels! 3 month min preferred, year round. Location was great, pool was nice and enjoyable on 1 of our days. Layout of house is also nice. There is need of some TLC in places, like towel rack in master bedroom down hall-it falls off. More lighting on the back patio would be appreciated, clean patio furniture. We didn't have dishwasher soap, dead bird on patio has been there a while. Suitcase holders would be nice as well as Kleenex. Had difficulties with TVs in a couple bedrooms, but on last day found third remote under bed which solved the problem. There was more under the bed too. Very clean upon arrival. Very quick response time to emails and text messages. Plenty of room for everyone! We stayed for a bachelorette party and had a great time! The house was perfect for our trip. It’s close to the mountains and Old Town Scottsdale. Highly recommended staying here! We’ll be back! Great location. Layout is good for large groups and family gatherings. Overall impression on the property is very good. The house met our expectation for allowing family to visit during our month long stay. The area provided lots of dining, shopping, golfing, walking, hiking and easy access to the airport and other sightseeing attractions. However, there are improvements that could be made to the back yard. Also, due to the cooler than average weather we had a heating option to the pool would have been nice. The laundry area is very dusty/linty due to no venting to the outside. We would consider using this property again if wanting to come back to the area. We just completed a week-long visit to Chiquita House with three generations of our family - six adults and two children ages 2 and 5. The location was great for the activities we planned (hikes, parks, Old Town Scottsdale, Children's Museum, Electric Desert, Grand Canyon, Fountain Park, Sea Aquarium, etc.). It was intriguing to see how the neighborhood is being revitalized with a good number of traditional homes and a good number that have been/are being transformed into magnificent Frank Lloyd Wright-esque mansions. The home itself was very spacious and comfortable with a lovely pool and backyard. If future travels took us to Phoenix, we would stay there again! Myself and two friends game to golf in the area and the house worked out perfectly. The beds were comfortable with plenty of room to move around. The home was well equipped with cooking essentials that saved us time and money buy cooking meals at home. Very organized with cabinets marked so you knew where to find everything. They even had a ping pong table and practice area to chip and put. The location worked out nicely, close to fashion square and Old town. Would go back if we come to the area again. Very favorite home and location for family reunions, golf vacations, corporate housing, snowbirds, sportsfans, Barrett Jackson, Russo Steele, and Good Guys car shows, Cactus League Spring Training, Phoenix Open. Arabian horse show, and so much more! Rates may vary for special events. (Holiday periods, spring break, holiday weekends, Barrett Jackson week, Phoenix Open, Fiesta/other Bowl events.) Please inquire about last minute discounts. Security deposit may vary according to number in party and duration of stay.